Because changes you make today really do make a difference tomorrow! Are you fairly healthy, but you know you could still improve things? Are you are worried about how the little things may be adding up to affect your health negatively? The good news it you don't have to do it alone! A Health Coach is trained to help! I am trained in lifestyle, exercise, attitude, and nutrition - the LEAN health coaching approach! ​And if you are worried about disease, well I've got you covered there, too! We can solve your kitchen issues by working together to build a solid foundation of science-based, common sense nutritional know-how. After that we start working through goals and desires. And of course there are weeks when we focus on overcoming setbacks. Health coaching is a personalized approach to gaining an understanding of nutrition basics. I don't teach diets, fads, or any approach to food that would make you or your family miserable! I do, however, take into account any personal concern around food, diet, or health. Sooo... what can health coaching do for YOU? Health Coaching is all about achieving YOUR goals and answering YOUR questions. More fruit and veggies on the table is a huge one. Worried about what kinds of carbs and how many carbs to eat? Yup, I can help with that one, too. You may be concerned about what kind of fats yo are eating, and how you can eat the so-called healthy fats for heart and brain health. I've got you covered! And of course there is the general goal of eating more healthy. We will define what "more healthy" means to YOU and then we can break that goal down into baby steps to take one day at a time. Using a common sense approach, we will shift your habits to include healthy food and healthy hobbies as well. Making sure you are getting moving on a regular basis, whether it is biking or walking or dancing or jumping. We will find a way to make health your hobby. 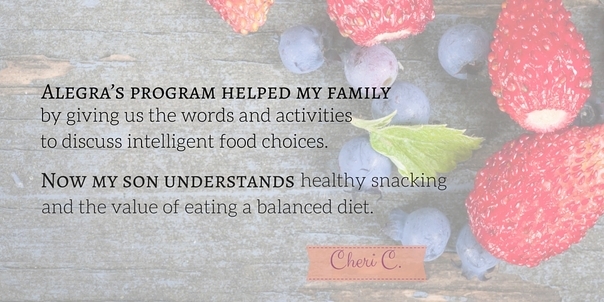 With my support, you will forge a path to making confident decisions about meals AND snacks. My Optimal Health Program begins with a two fold approach to giving yourself an oil change. First, you will increase your intake of Omega 3 fats. I recommend doing so with a purchase from Vital Choice. Vital Choices is an ocean to table service, buying salmon and other seafood products and quality organic products direct from fishermen and suppliers, and shipping them to your door. Yes, you can purchase seafood from a huge number of sources, but the quality of nutrients and the fresh flavor from Vital Choice is hard to beat! It is endorsed by the Dr. Sears Wellness Institute, where I earned my health coaching certificates, and it is rated 4 and 5 stars by almost all consumers who try their products, including me! Second, when you commit to this program's three simple steps, it includes a Pantry Makeover. That is your opportunity to make sure you have BANISHED the trans fats that dramatically increase your risk of heart disease. Together we will find every food with trans fats, even the ones whose labels say "0 grams trans fats!" And we will arm you with simple substitutions to start eliminating the bad fats immediately. Did you know the recommended servings of fruits and vegetables is 9-13 per day? THIRTEEN servings of fruits is vegetables is optimal! That is a LOT of produce, even for those of us who are healthy already! That's why I, and the Dr. Sears Wellness Institute where I earned three of my Health Coaching Certificates, recommend supplementing with Juice Plus+. Juice Plus+ Orchard and Garden Blends provide added whole food based nutrition from 20 different fruits, vegetables, and grains in convenient form. Each ingredient is specially selected to provide you with a wide range of nutritional benefits. Juice Plus+ is made from fresh, high-quality, healthful fruits and vegetables and is carefully tested to ensure that no pesticides or other contaminants affect the natural purity of the product. There are competitors to this product on the market. however, Juice Plus+ has been researched and published in over 35 peer reviewed journals with proven benefits for optimal health. 3. Give Yourself a Makeover! A Pantry Makeover is one of my signature services and is a fun hour via Skype (or FaceTime), where we go through your kitchen, answering all your questions and looking for opportunities to put you on the path to optimal health. While the first two are simply adding wholesome, health supporting foods to your diet, the Pantry Makeover takes a comprehensive approach by pointing out what you are already doing well, and at the same time finding foods you can upgrade for healthier choices. The Pantry Makeover is a chance for focused, personalized support to customize YOUR grocery list in way that makes it EASY and SIMPLE to start making healthier choices as soon as your next grocery run. As a health coach, I am here to answer my clients' questions! You will gain access to my private Facebook Group, where you can ask questions about nutrition, or anything else related to health! You will receive email support and have access to me via email to support you on your journey, ask questions, and keep yourself on track with your goals! I hope you want to learn more about how these three steps can help you achieve optimal health. Book a free 30 minute call here and I can answer ALL your questions. Because this program requires orders being placed on multiple sites, you should schedule a call with me to place your orders and book your Pantry Makeover. Book a complimentary 30 minute call here and we can get everything set up! Everyone loves an all-inclusive package, which is why I include the following bonuses when you purchase today. MY goal is to make sure you everything you need to achieve YOUR goals! Bonus #1. Free Pantry Makeover to start your Health Coaching off right. ​With your initial purchases of a 4 month supply of Juice Plus+ Orchard and Garden Blends ($44.50/month) and $99 or more worth of products from Vital Choice, you will kick off your Optimal Health with a Pantry Makeover at no extra cost! That is $199 value, yours free just for committing to changing your oil and boosting your fruits and veggies... which you WANT to be doing anyway! Juice Plus+ products always offer free shipping! Vital Choice purchases of $99 or more include free shipping, too! That could easily cost $19... or who knows, even more! Bonus #3. One free follow up session to be used within three months of initial purchase, valued at $99. This is the perfect way to keep your awesome momentum going after you've started experiencing the benefits of "changing your oil" and "boosting your fruits and veggies." Bonus #4. Access to my private Facebook group, where I answer questions and you can get inspiration, ideas, and support from others working toward optimal health, too! That is a total bonus package worth $317 or more! I pride myself on my science-based education and my common-sense approach to supporting my clients. I have also lived through - and survived- some serious mom funk when it comes to the kitchen! So I totally get it. You want to be informed, you want to make positive changes, and yet who has the time? Time is the biggest constraint on us all, but magical things start to happen in the kitchen when you commit to change, make a plan, and get support on achieving your goals. The magic spreads throughout your family, leaving everyone with a better attitude when it comes to the kitchen table. You will look forward to dinner, you will enjoy time in the kitchen, and your body will crave wholesome foods in a way it hasn't before. I've been there, and I've come out the other end, with a rhythm to my days and weeks that allows us to eat healthy, enjoy each other's company, and of course enjoy indulgences - when I choose! If this has you lit up thinking about how awesome YOUR dinner table experience could be, then book now. Good things await you in your kitchen!